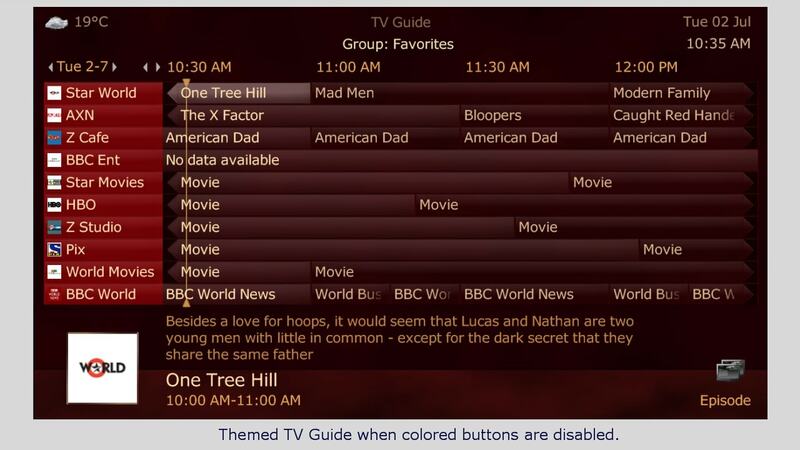 Version 3.6 introduces custom colorized themes. Fourteen themes are provided to get you started. 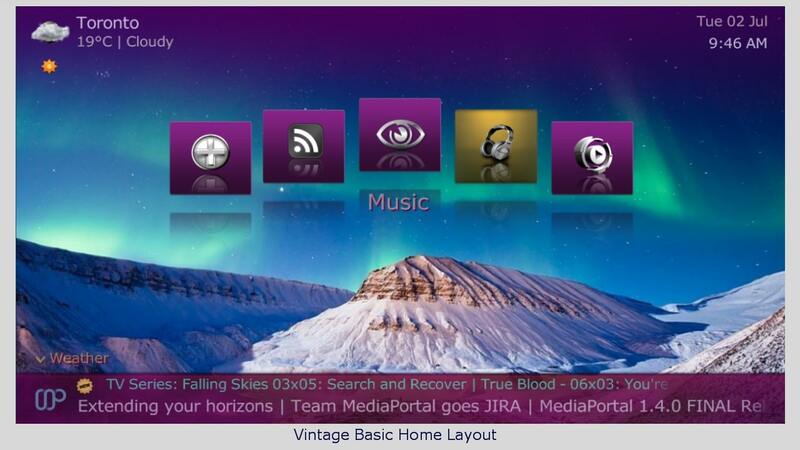 Simply edit the colors for text or graphics in the aMPedColors.xml in any theme folder to modify a theme to suit your monitor, TV or decor, or create a whole new look in minutes! You don't need to create a single graphic, but of course you can if you wish! 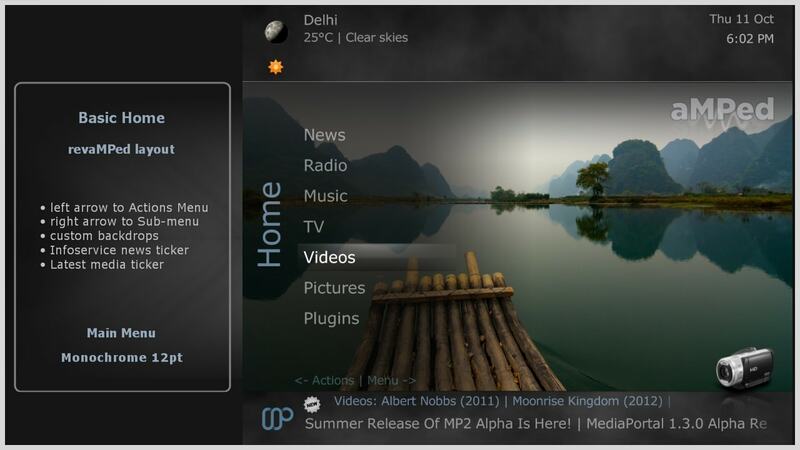 See Custom Themes in the aMPed Wiki for details. 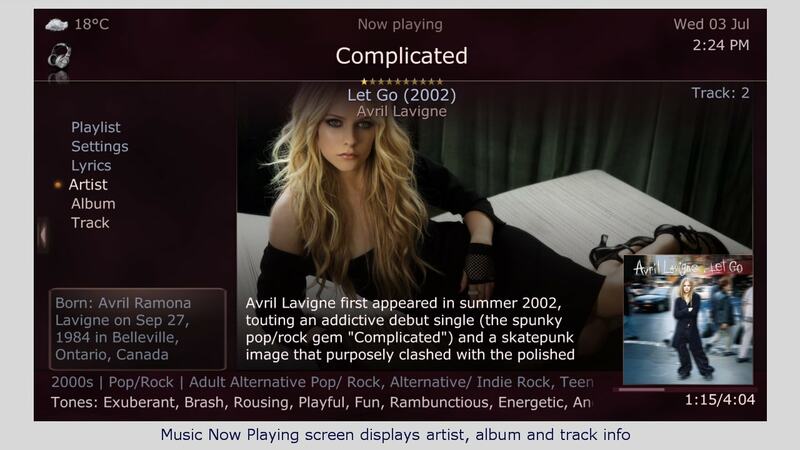 Check out all the unique Features, or find out What's New in the aMPed Wiki. 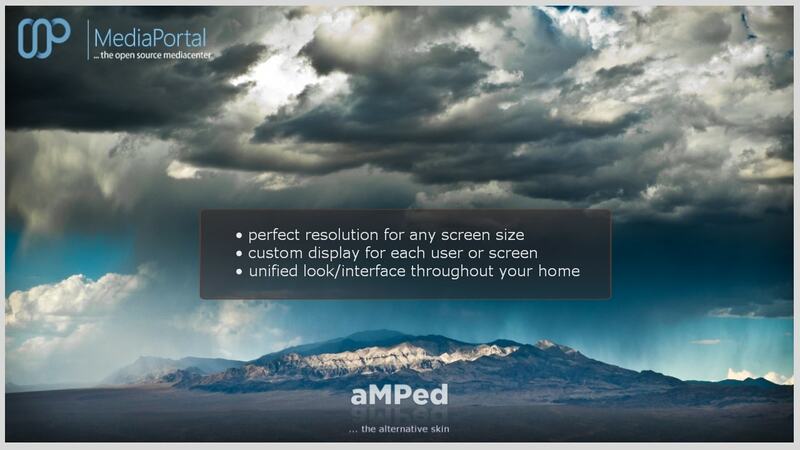 aMPed is the skin you can practically design yourself!  While the main focus is on fanart/backdrops, you can choose the style you prefer: fanart, wide fanart (fullscreen backdrop) or no fanart; big or normal cover size, even the width of lists. Choose your options using aMPed Config via a Desktop or Start Menu shortcut and save them in Profiles so each user can load aMPed with their saved preferences. 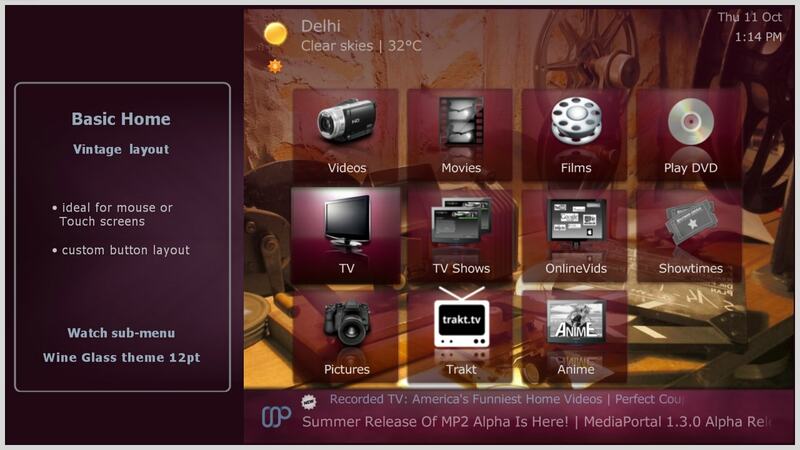 As of version 3.6 you can also change most settings within MediaPortal GUI Skin Settings. 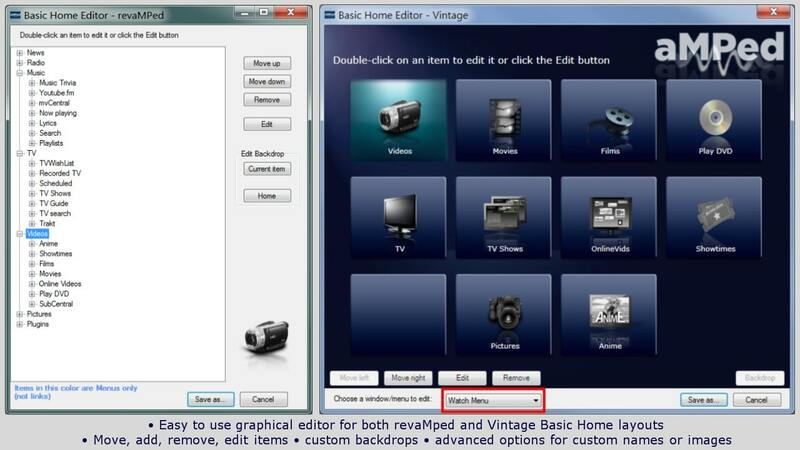 Use the graphical Basic Home Editor to modify menu items, backdrops and even the layout on Vintage Basic Home. 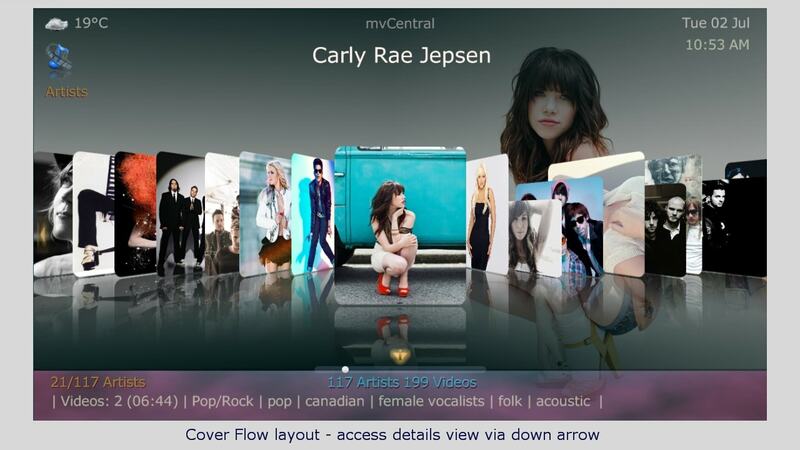 Create as many layouts as you like - one for each person in your household! aMPed is designed for you! Tell us how you like it. 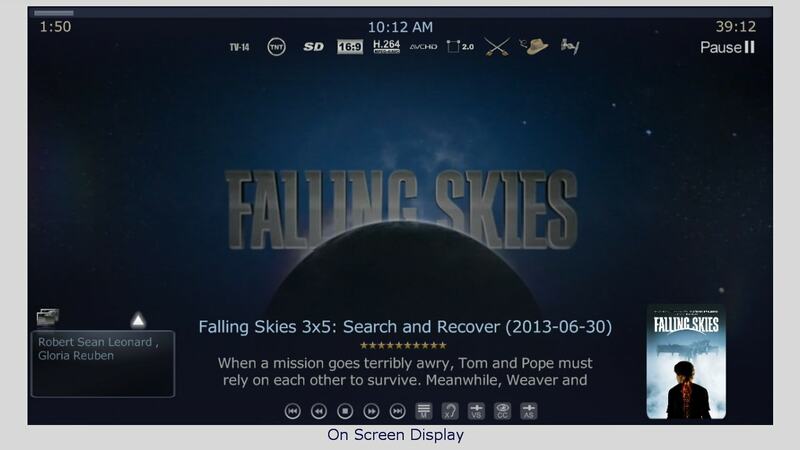 Please rate and post a review using the buttons above, and/or send us your feedback and ideas in the aMPed Forum. aMPed supports all MediaPortal features and 'built-in' plugins, Popular/Maintained plugins and many more. See Supported Plugins. See the Changelog for new and updated plugins in the latest release. The best skin for me, probably the one I'll stick with. 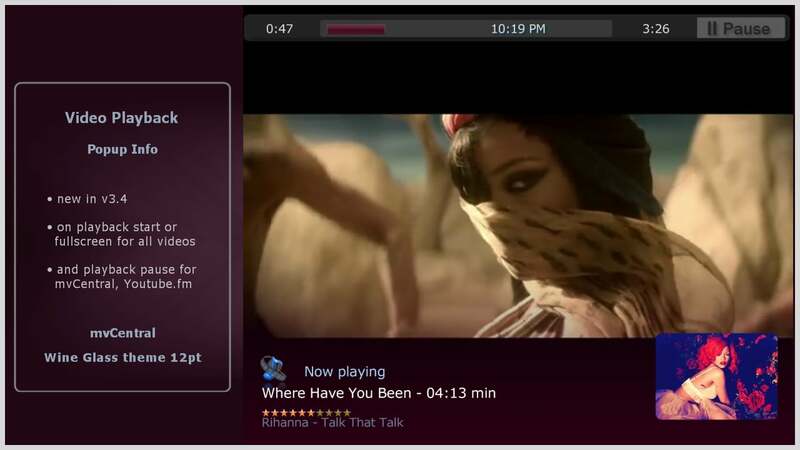 I'm very happy with aMPed skin, easy to configure for my needs, the pause and skip bar is at the top of screen which is a much needed feature for me, I use subtitles and this feature allows me to pause and still read the subtitles or any other on screen test which is located usually at the bottom half of the screen. The full screen backdrop art on sub menu screens is awesome, I wish that the main menu will also be represented above a full screen background fanart or some background and not divided by the menu left column, other than that which is a personal taste of mine the look feel and options are perfect. Thanks alltheway - full screen fanart/backdrops on Home screens is planned (when wide fanart layout is selected)! 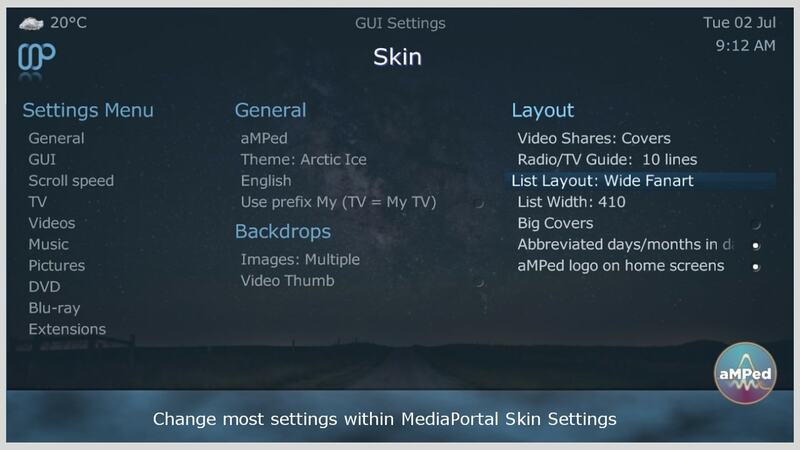 It would be unfair to call the newest version of aMPed a "skin" as it chock-full of sweet goodness; and what a better way to display all the juicy deliciousness that is MediaPortal! 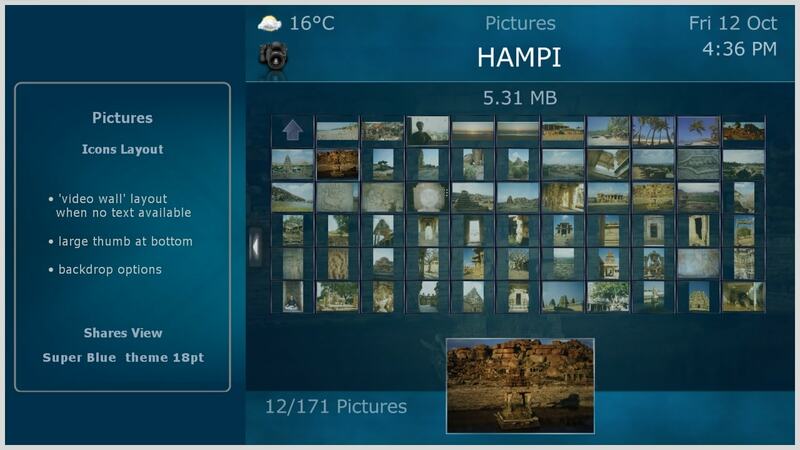 aMPed of course is the best option for 4:3 users, but great strides have been made in the 16:9 side. So much so that it can do "doughnuts" even around any skin designed for widescreen only! Of course the fact that the design is very open and supports 18pt font size for distant viewing are still the icing on this cake. New hidden menu items make navigation as easy as pie and offer direct links to some very common functions. 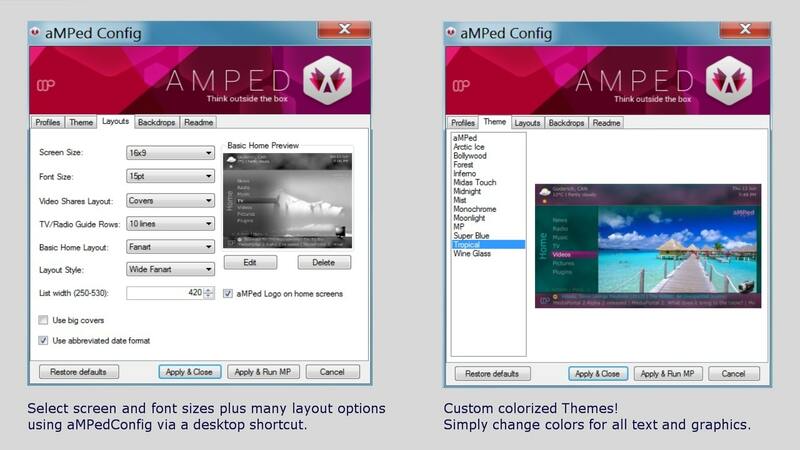 As always, aMPed continues to offer support for every popular plugin, helping you to realize "just how sweet it is"! 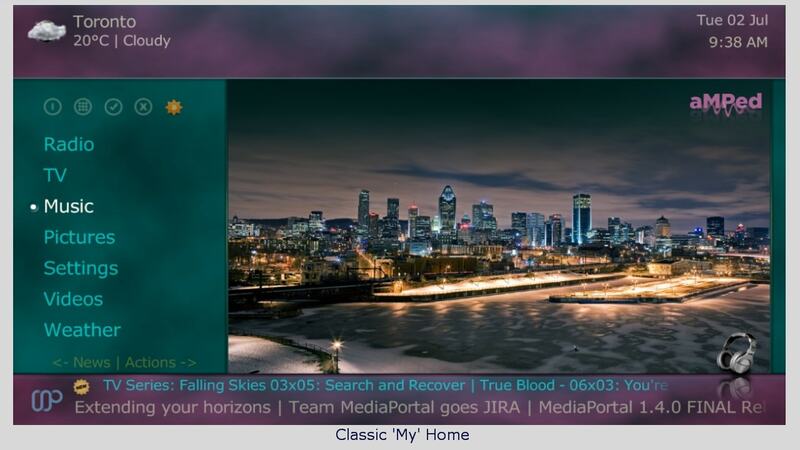 Whether you like lots of art, or want it clean, you can have it both ways with this skin with different profiles. 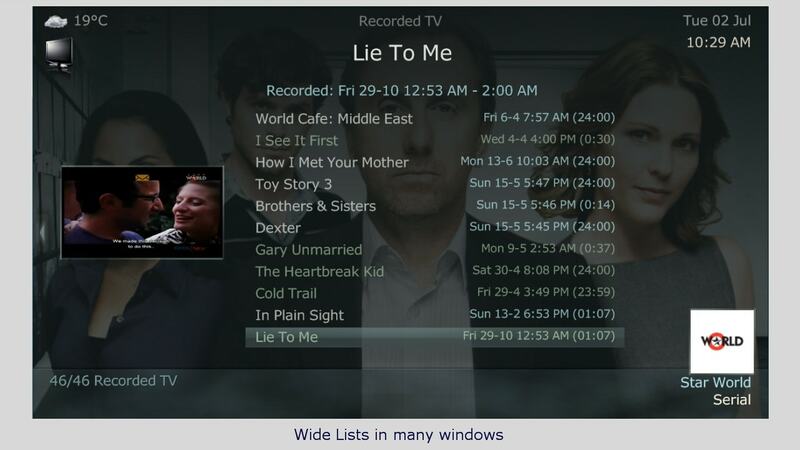 If you have a 4:3 TV this is the skin for you 3 different font sizes to choose from and 2 different TV guide setups 10 and 8 line, but also comes in 16:9. I just love the Monochrome theme, it's awesome. Try out this skin you'll love it too. Best!!! Skin for small screens/TVs. Really one of the best! And with a good team behind! Thanks for this skin! 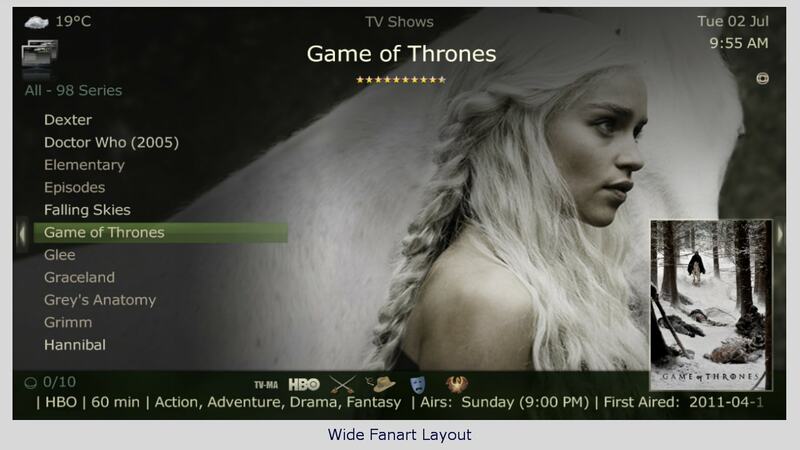 Love the new widescreen option! The skin of choice for those still with a 4:3 TV. So many options, plugin support, and a fantastic installer and config program.